Telcos Spark and Vodafone have topped the list as the most complained about companies according to the Commerce Commission. 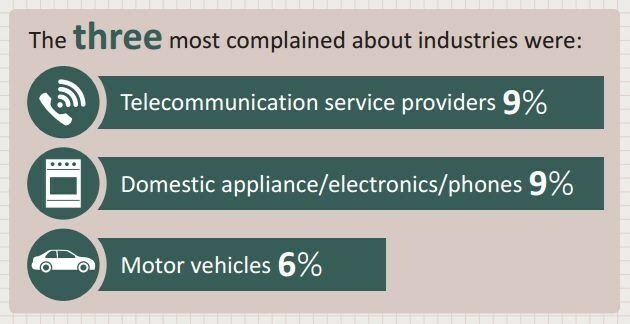 The Commission released its 2016 Consumer Issues Paper which showed a quarter of all complaints to the organisation were about just 21 companies with pricing the most common issue. Spark received the most complaints with 140, followed by Vodafone with 133 and then sellers on Trade Me with 121. Commission chairman Mark Berry said the report, now in its second year of being publicly released, highlighted some interesting trends but stressed that complaints did not necessarily mean companies had broken the law, adding that larger traders were more likely to receive complaints. "Consumers complain to the Commission most about price (26 per cent), goods (23 per cent) and services (22 per cent), while one quarter of our Fair Trading Act complaints relate to just 21 traders," Berry said. Both Spark and Vodafone were quick to respond to the report, saying the result was disappointing. Vodafone's Liesbeth Koomen said while the company aimed to provide a great service experience, it sometimes fell short and received complaints. Spark's Jason Paris said the Commission had reported the total number of complaints regardless of whether the complaints were upheld and said ultimately none of the complaints about Spark had been taken forward. "We're disappointed in today's Commerce Commission league table of 2015 complaints, as we're working very hard to improve our customer experience," Paris said. "Improving customer service is our top priority and we have seen noticeable improvements recently. Where complaints identified areas where we could improve its processes, these changes have been made." Non-bank lenders also featured prominently in this years report with complaints about non-disclosure, irresponsible lending and targeting of vulnerable consumers. While finance companies make up just 3 per cent of the credit market they account for 43 per cent of credit-related complaints to the Commission. Berry said the report was produced primarily as an internal tool for the Commission to help it decide where to focus its efforts, but said it believed the information was also beneficial to others. "We choose to share the report publicly as we believe the information is of wider interest and benefit to consumers, traders, advocates and community groups. We are grateful to all the organisations that have contributed to making this report such a valuable resource," Berry said.